The hosts for the night Shin Dongyup and actress Lee Sungkyung (who did an opening song and dance for the ceremony) did start off by telling winners to try and make their speeches as brief as possible due to this being a live broadcast and not wanting to run over time, which I thought was a pretty poor move to make that chances are that you’ll forget someone if you speed through things but there you go!The nominees for the Daesang are given right at the start and will be announced at the end of the ceremony. The winner is determined through viewer voting. Speech : This is my first time winning such an award. I’ve a lot of people to thank but I’ll call each one of them later. My friends were surprised at my dream of becoming an actor and this feels like I’ve gotten one step closer to this dream so it feels pretty great. This is an honour I’m very grateful for. I’ll work hard to become a good actor. Thank you. Speech: I was nominated for this award two years ago. I thought then that I really wanted to receive this award and now that I have I feel pretty lacking. I lack a great deal…sorry…but I’m really grateful for my fans. I know you said to make this short, but I’ll quickly try to include this. To all the actors, staff, and the PD that worked on The Scholar Who Walked the Night throughout this hot summer, you’ve worked hard. A huge thanks to my loving family and finally, I’ll will become an actress who always worked with a grateful heart no matter what happens. Thank you. Speech: Thank you. Writer Kim Sungho My Daughter Geum Sa Wol, Park Sungha, Director Baek Gomin, PD Lee Jaehoon, to all the directors and staff, I rely want to relay how grateful I am. To the CEO of my agency who’s likely happier than I am, he actually told me not to date or get married before receiving an award. I’ve been solo all these years but it looks I lie can date now, thank you hyung. My family who’s watching at home, to my friends and mentor, thank you. Doing a 50 episode drama there were times when I lost focus, but thinking of these successes I will grow to become a responsible actor who works hard with the success of his drama in mind. And to everyone I’ve forgotten, I love you all. Thank you. Speech: Thank you. First of all, I’d lie to thank God who brought someone like me who lacks so much to this stage. My grandmother actually passed away while we were filming Queen’s Flower. She passed away peacefully and was the person who encouraged me the most these past 20 years. To my loving family and those with them,because of your love, trust and encouragement, someone as lacking as me was able to do something this cool. I’ll become an actress who continues to give her all and does her best. Thank you. Speech: Hello. I won this four years ago and I’m getting this again. This award is very heavy. Those who made She Was Pretty so enjoyable…err…who was it? Anyway, Writer Jo Sunghee, PD Jung Daeyoung, all the hardworking staff noonas and hyungs, I love you all and thank you. And to who Seojoon hyung and Jungeum noona who said I was handsome, I’m very grateful. To my family, I love you all. And to everyone watching, Happy New Year! Actor Ahn Seha who played Kim Poongho in She Was Pretty sang one of the OSTs with Hong Jinyoung, probably familiar to everyone who’s seen the drama,and the man has a beautiful voice. Hopefully this comes on on video soon so I can add it here. Speech: Thank you so much. This is such a special award that I never dreamt of receiving it. 2015 is definitely a year I’ll never forgetting, from Kill Me Heal Me at the start to to She Was Pretty, which both received a lot of love. I’m really grateful. I’m really grateful for even being able to act and for to be able to receive such a big award. Thank you. Speech: Buonasera….uh…Why? Uh…Kim Heewon’s actually an actor I like, and we even did a drama together so receiving these awards together is an honour. A lost has happened this year, I feel like I’ve been given a big gift. Whenever I look at a drama, I was wonder whether I can pull off the character properly without getting in anyone’s way. What I did in this drama came from other people really, 95%, from my colleagues, from the staff, from them looking at my ideas. If they weren’t there, I wouldn’t be in this position. Just like I’ve gotten to this position through your appreciation and love, I will continue to listen to others and become an actress who does her best. Thank you. Ji Sung, Park Seojoon and Hwang Jungeum are interviewed beforehand, seeing as they’re in the interesting situation of all being paired with each other. Jisung says that words would fail him if he and Seojoon won the award, and that he’s already received a couple award with Hwang Jungeum whom he’s very grateful towards, and he always feels that they’re working together. Hwang Jungeum, when asked to choose between Jisung and Park Seojoon says it’s too tough a choice to make and it would be easier if they just won the award with each other. Seojoon says that he misses Yona and it was the first time that a girl pursued him so aggressively. He doesn’t know how to react if the two of them win it but there you go. It’s pretty rare for a male-male couple to win a couple award. The last time this happened was in 2010 with Yoo Ah In and Song Joongki in Sungkyungkwan Scandal. Here are Yona and Rion Seojoon and Jisung’s reactions upon hearing the win. Jisung: This is strange but an honour. I really want to say this line at this point. Just a minute, I’ll prepare it…O-o…Ooo…oo..got it…OPPA! Jisung: Thank you to all the fans who loved and voted for this couple. At first it was awkward and there were a lot of people when we were filming in Hongdae. So it felt embarrassing when I was running around yelling “Oppa! Oppa!” because though I’m an actor, I’m not a woman. But Seojoon’s reactions were great and really treated me like a female highschooler, so Yona received a lot of love. And personally, receiving this best couple award with Seojoon really feels good. Seojoon: As for me, when I first started Kill Me Heal Me, I never imagined what sort of romance I would have with Yona. Looking at the script, it kept going in a strange direction with regards to that which ended up in my lips getting kissed a lot, which was a bit embarrassing. To all the viewers who loved Kill Me Heal Me, thank you. It was because of you that we received this…at any rate meaningful award. Thank you very much. Hwang Jungeum: Thank you! This is more meaningful since netizens worked so hard voting for me. For past while I’ve been really busy and running forward really hard. To receive this as acknowledgement makes me really happy. I’ll work hard to upgrade my acting. Park Seojoon: Thank you. Ah the mike moves on its own. In 2015 with ‘Kill Me Heal Me’ and ‘She Was Pretty’ I received a lot of love. Since this is an award that many fans have given me, I’m even more grateful. When you’re on set, all you think of is the acting. While I’m happy, I always wonder about how to give back to the fans. It’s like homework for me. I’ll do my best to give back more love to my fans and become a better actor. Each of the stars were interviewed. Cha Seungwon, Lee Junki and Kim Heesun weren’t present though. Park Seojoon: It’s a bit embarassing (on having 3 trophies already) but I’m very grateful. It’s because of great shows like KMHM and She Was Pretty that I received this award. I’m grateful towards KMHM’s PD Kim Jin Man and writer Jin Soowan and She Was Pretty’s PD Jung Daeyoon and writer Jo Sunghee for having given me this chance. Yoo Yeonseok: I debuted in an MBC drama and this is my first time receiving an award from MBC so thank you. Warm and Cozy was a feel-good show and received lots of love. I’d like to thank all the staff and the PDs who worked and filmed with us in Jeju and the writer. Because of you, this year’s wrapped up in a warm and cozy fashion. Hwang Jungeum: (when asked about how worried she looked every time she gets an award because she might miss out on getting the Daesang) No, no, that’s not it at all. I’m with Ji Sung sunbae whom I love very much and all these wonderful actors and if anything I’m embarrassed because someone as lacking as I am keeps coming on stage and receiving awards,And I’m wearing rather high heels so my back’s hurting a little bit so… that’s why my expression’s a bit off. Kim Yoojung: To all the viewers who laughed and cried with Angry Mom, thank you very much. Than you all the actors, staff and the PD. I’ll think hard about my next project and become a hardworking actress. Thank you! Ji Sung: (when asked with there was a particular fun episode he remembers) Rather than an episode, for someone as lacking as me to receive a task as great as this was exciting. While acting, I couldn’t help thinking that I made the right choice in choosing KMHM and acting. This is my second award from KMHM and I’m really happy. Once KMHM ended, I didn’t really get to give my farewell tot he scriptwriter so I’d like to say it here. What she created what was I inhabited and that’s pretty amazing and praise-worthy. Because of you, this winter was amazing, thank you. Speech: Sorry I was taken by surprise [aww he’s crying]. There are so many people I want to thank. Everyone’s who’s with me, who’s in my heart, thank you so much. I started acting as a student and I never dared imagine that I would ever reach this height so receiving the chances to start in these dramas and previous works is a miracle to me. I will continue to work hard to charge towards that beautiful miracle. And I want to thank my mother who’s here as well. And to all the fans who’ve given so much love, thank you very, very much. Speech: We spent 4 months in Jeju Island. I always thought that Jeju was close by but it was felt further than I thought, so though it was hard working filming there it also felt like I was on holiday. To the writer and PD who helped me dream a good dream, Yeonseok oppa, and all the staff, thank you very much. I always thought I’d forget if I got an award but a huge thanks to all my management’s staff and my family and fans. Thank you! Each of the six nominees for the Daesang are asked to say a few words. Only 4 of the nominees are here, as Cha Seungwon and Kim Heesung had other schedules. Hwang Jungeum: (when asked if her mind has changed upon receiving all these awards and if she doesn’t want the Daesang anymore) Of course I’d still like to receive it. But as I was acting in KMHM, Ji Sung oppa worked really hard, and his acting was really good so personally, I would like it if he won it. MC Shin Dongyup: So if you don’t receive it, you don’t want anyone else to receive it but Jisung? Jisung: (when asked to honestly say how he feels) I’m afraid I might say something useless. MC: No, that’s fine. Go on. MC: There are two people watching at home now, right? Please say a few words to your wife and daughter. Speech: Thank you. To Scriptwriter Jin Soowan, thank you for writing such a good script. KMHM is a drama I won’t forget, and was one I spent a lot of time thinking over during the shoot and after it ended. Thank you PD Kim Jin Man. Actually, whenever I can’t understand the script, I become unable to move a muscle on-screen, quite a dangerous actress in that respect, but he spent 1 hour talking over it with me and directing me [aww she’s crying] thank you so much, Director. And to writer Jo Sunghee who made Kim Hyejin so lovable…ah what should I do…to all the directors and assistant directors who made Hyejin come out so well. There are so many people who helped. I actually still have an acting teacher who looks over scripts with me, thank you so much. To CJes and my management staff, thank you. To my wonderful and healthy mother and father, and my brothers, to the staff that works so hard, I love you all. 2015 is a year I won’t be able to forget. Happy New Year everyone. Though I lack so much, I’ll work hard to become a better actress. Thank you very much. Speech: Thank you. I always run out of words. Whenever Shin Dongyup asks me anything, I’m can never give a good answer. Now that I’m on this stage, I’m going to do my best to convey how grateful I am. It feels like barely no time has passed since I became an actor. Times flies so fast. While acting in each drama, I kept questioning what sort of person I wanted to be and what I wanted to do going forward and what character I should return as in a show. I’ve always been aware that my present position is one to be treasured. KMHM’s like that to. Multiple personalities? I don’t know about stuff like that very well but my dream of taking this challenge on as an actor was so strong that it was a drama I really wanted to do. So when the script came to me, I was happier beyond what I can put into words. When starting I wasn’t excited or nervous, I kept thinking of what I was trying to say and what the drama was trying to say. I lack a great deal and am quite a loner but I receive a lot of love from my wife, from my family, my colleagues, which has allowed me to continue as an actor. I’m always grateful to these people. This drama means a great deal to me, and in the future, when I’m hurt or lonely or feel like giving up, I’ll always think of it. To everyone who loved and accepted this drama, I believe that we all have multiple-personalities or 2 or 3 faces we show people. I think about why we have these faces and why we want to be strong…[music starts playing]...was it too long? I still want to say it though. I wanted to give comfort to everyone and make you feel happy so when I hear how grateful my fans are, I think ‘Ah I should work hard’ and that KMHM was a good choice. That was a bit long. PD Kim Jinman, my friend of 10 years, it was great to meet with you in another production. All the hardworking staff who made sure production was ready before broadcast, and writer Jin Soowan who made us shine, thank you. To all the actors and sunbaes, I’m grateful that we did KMHM together. Everyone, I think I’ll always remember this. ‘Remember, 2015’. Thank you. Jisung: Wow…this is really hard to believe. This is an actor’s dream. When I first snuck into the MBC building and stole a script and went to the filming location to watch the sunbaes film, for someone like that to receive this Daesang..No way….I said this earlier but there is this one director I remember most. When I was a rookie and terrible at acting, he cast me. And because I was so bad at acting he said ‘I’ve never seen someone as bad as you. I regret casting you’. But I just received a lot of love with KMHM, and I received the most applause I’ve ever received in my acting career and I always feel like he’s with me. Director Park Seongsoo, thank you. If he wasn’t there, I don’t think I would be on this stage. I lack a lot so this is enough for me. This award is actually enough for me. This award isn’t for me though but for everyone who made KMHM and to the KMHM fans, Mimi-deul, who are happier than anyone else right now. To my fans, I always want to show a better image as an character but there isn’t always a chance. To all the Amajeunesse who’ve been with me all this time, Ji Sung Gallery, and all the other fan cafes, thank you so much. And there’s one more person I need to thank, from Secret to Kill Me Heal Me, two productions in a row, my partner Hwang Jungeum. You’re an amazing actress. She accepted all seven personalities and reacted so well to each of them than even I was playing for real . I’m so grateful and I think that we won this together for real. This is why they say when you become an actor that you can’t control your reactions [aww Jungeum’s crying]. I’m so happy that you did this with me. Thank you too, Seojoonie and all the sunbaes. This is your award too. Congrats on your Daesang. There’s a lot I want to do but if there’s a chance to get a Daesang again, I’ll go for it. To those I especially want to thank, I’ll call you and thank you in person. Finally, though I lack a lot to be receiving this Daesang, I started 2015 with KMHM, so I want to say just this to myself, that I did well. I will take this as my beginning and continue to show you good acting. Everyone, stay healthy and be happy! And Happy New Year! Thank you! In other words all three KMHM costars walked away with 4 awards apiece 😀 so KMHM got 13 awards in total (including Best Drama). A great day for the actors and all us fans! 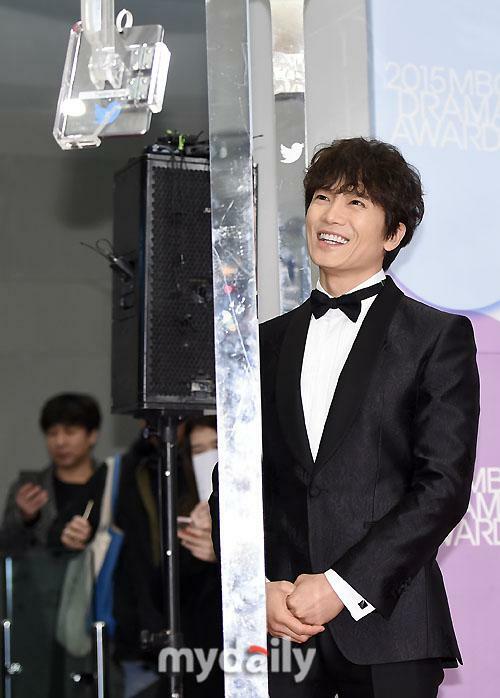 Jisung smiling at the 360 cam pre-awards ceremony. This cutie. How is he 38? Oh. It’s about time Jisung get this award. He did a fantastic job. I actually love Yona. The Best Couple award – hahahaha. So cute. Jisung the best, hope to see your new drama series soon! correct; PD’s choice award; not 50, It is 150. (50×3) (MBC,SBS,KBS total 150 pd vote each one actor at one brodecasting state every year.). PD’s choice award is independent vote without b-state interest. So very precious & rightful, honer award. Someone say PD’s choice is vice-Grand prize. Oh thank you!!! I really wanted to read the translations.